Centred on an Indo-Canadian girl growing up in Delta, Everything Was Good-bye brings light to many struggles that come with self-discovery, love, loss, cultural expectations and growing up as an outsider. 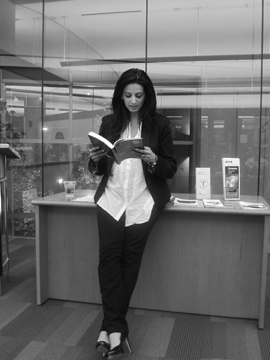 Gurjinder Basran, author of the book and Kwantlen’s new writer-in-residence, spoke to the Runner about writing, racism, feminism and what inspired her onto her debut novel. Sarah Schuchard: What made you decide to pursue writing? Gurjinder Basran: It was mostly by accident. I’d been starting to write in my journal just about my childhood … my teenage years, and my sisters. I have been sharing some of those thoughts about our upbringing and those difficulties. Then, after a while I just started to fictionalize things that happened to me and I found I started really enjoying it and it was the best part of my day. Then, eventually after six or seven months of writing at home for my pleasure I saw an ad for a continuing education in Simon Fraser and I thought ‘I’ll apply’ and they took 20 people a year into their program. I thought it couldn’t hurt, and much to my surprise I got in. SS: What advice would you give to aspiring young writers? GB: It’s sound advice and I think everyone gives it: write a lot, read a lot. I remember reading, as a statistic, that to even get good at anything you have to work at it for about 10,000 hours. Ten thousand hours equals mastery, and I think now I’m only at 6000 hours. So, I would just say write as much as you can, read as much as you can and surround yourself with people who like writing and have a high taste level. SS: What made you pursue a fashion degree at Kwantlen? GB: I always loved [and] I always looked for creative outlets. My first creative outlet was music, but there was absolutely no way my mother would let me pursue being a musician. I liked to sing a lot. I knew that that was out and my other love was design, and I still love the design. For me, being a teenager, I took a lot of sewing classes sewed my own clothes, had an interesting look, and it was just something that I thought was accessible. There was a school I could go to, it was just more practical than being a singer, and at that time being a writer didn’t even enter my thought process of what I wanted to do. SS: Your book is centred on the Indo-Canadian teenage girl, Meena. Did you form that character about your experiences? GB: In some respects, I would say it’s a really loose attachment to me. I grew up with the same environment. You know, six daughters being raised by my mom here in Delta, and my father had passed away shortly after we moved to Canada. So that all felt really similar and I was an angsty teenager in the same ways that Meena was and very inwardly rebellious, very judgemental. But, outside of that I would say that, core characteristics, she’s definitely her own person. SS: With the book that you wrote featuring a lot of strong females how would you describe your views on feminism and women empowerment? GB: I didn’t necessarily go into the writing with a feminist slant; however, since writing it, many of the things I’ve wrote about I realize now that I’d probably always felt that way. Again, coming from a family of all women, my mother was an extremely strong individual, I was an extremely resourceful individual, but what always concerned me was when she and my sisters and my family and all the community around me there was all these strong, wonderful, articulate women and they seemed to have limited choices. Although I didn’t set out to write a book about a women’s ability to choose her own path or to self actualize, it has become something very important to me. You know that every woman has the right to choose and shouldn’t be limited by what people tell her, what the media tells her, or all the things that are, all the small subtle gender specific messages we get from a young age. SS: Before you wrote your book Everything Was Good-bye, was not being aware of your beliefs of feminism and women empowerment limiting? GB: Yes, and not on a conscious level. I don’t think I ever thought ‘Oh I can’t do this,’ I just understood I couldn’t because from a very young age as a woman, especially as an Indian woman. You just know that certain things are going to be a part of your life. For example, you know that here in Canada you’ll be educated, you’ll probably be married, you’ll probably have children — these rights of passages, I never really questioned them. It was just my world. SS: You initially got the idea for this book by writing in a journal. What kept you going and inspired you to make a book out of it? GB: It just really consumed me. I think Virginia Wolfe talks about being on the scent –– just being on the scent of some idea and you just have to chase it. It was almost at certain point a compulsion or an obsession. SS: What message did you want your readers to take away from the book? GB: I didn’t really have a message I wanted to convey. A lot of the things that came out as core messages after it was written were really a surprise to me. Originally, I had thought I had written a story about a boy and a girl, which it is, but it’s also about family and grief and a woman’s place and all these other ideas that I hadn’t thought to write about that just appeared through the story. I really just want readers to read it and have them think on it, and have a dialogue. I think that readers bring as much to the reading to the book as writers puts into it. What you take away from it isn’t right or wrong, and what I took from writing it isn’t right or wrong, it’s just different. I think that my hope for readers is that they just internalize it and find what it meant from them, even if it’s completely different from what it meant for me. SS: Growing up as an Indo-Canadian, what was it like for you in high school and trying to fit in? GB: It was absolutely terrible, yes it was terrible. By the time I was in high school, a lot of the racism of the 1970s was behind me. However, because it was experienced at such a formative age, I would say it certainly changed how I felt about people and how much I trusted. Because I wasn’t allowed to engage in all the other activities that most teenagers engaged in, I really felt kind of on the periphery of those things. I just didn’t really fit in. SS: Do you see the racism and stereotypes that you experienced in your youth still present today? GB: I would like to say that it’s changed, but I don’t think it has. I don’t think that we’re very far into living in a cohesive community yet. I think there are a lot of assumptions on all sides and part of that goes to the lack of authentic representation. Yes, we see a few TV shows with some Indian people in it, but those people are often portrayed in the same way — they’re quite flat characters. So I don’t think until we can see a more active and fair representation of all ethnic communities we’ll still have those stereotypes.